Back in May at the Google I/O the company had announced the creation of its mobile VR platform called as Daydream. Today they have brought the platform into reality by unveiling the Daydream View headset and controller. The Daydream View costs $79 in the United States and will be coming to countries like Canada, United Kingdom, Germany and Australia soon. With Daydream it was Google’s vision to bring high quality virtual reality experience to the masses but sadly the only smartphones that are compatible with the Daydream View and Google’s own Pixel and Pixel XL smartphones. More smartphones will be able to support Daydream but in the future. Google tries hard to justify the price of the Daydream View by adding just a little bit extra to it. It looks like a VR headset but Google has used soft breathable fabric to coat the Daydream View inspired by the clothes we wear. This not only makes it more comfortable than plastic VR headsets like Gear VR but also stylish as well. The highlight of the Daydream View is that there are no pesky slots to put your smartphone in. You just drop the Daydream-ready smartphone in and the auto alignment system in the Daydream View will adjust the smartphone. The Daydream View comes with its own controller that can be used to interact with the content that is playing on the smartphone. The controller understands hand gestures and you just wave to interact instead of pressing buttons. The controller can be easily stored inside the Daydream View so that you do not lose it. 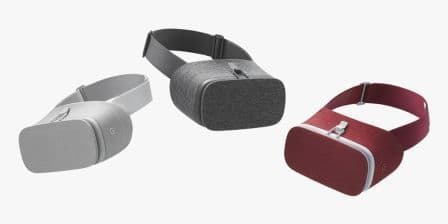 The Daydream View will be available in Slate, Snow and Crimson colour variants. On the Daydream View you get to enjoy content from YouTube, Google Photos, Google Street View, Google Play Movies, The New York Times, The Wall Street Journal, MLB, NBA, Hulu, HBO, Netfilx and games from various developers. The Daydream View will be up for pre-order from October 20 from the Google Store.